The Tapulanga Foundation is looking for a donor/s to sponsor Eughene G. Estoesta. Get to know him and you can choose to sponsor him! 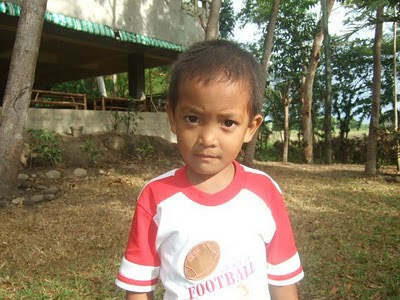 He would like to start Kindergarten in SFAS in June 2010. I am Eughene G. Estoesta. You can call me Eu. I was born in October 30, 2003. I live in Hacienda Lonoy, Silay City. My father is Eden and he works as a laborer in a sugarcane farm earning $30 a week. My mother is Medelyn and she stays home. I have one sister, Nicole Marie, and she is a 3rd grade student and scholar in St. Francis of Assisi School as well. I want to be in the army when I grow up. I love to play with toys especially if it's a Batman toy. I help my mother in cleaning the house. It costs Php7000 or $160 a year to send Eu to school. Add Php2000 or $50 to include uniform and supplies already. IF YOU ARE INTERESTED TO HELP HIM! PRAISE GOD! GREAT NEWS FOR EU AND HIS FAMILY. HE WILL BE GOING TO SCHOOL WITH HIS SISTER IN JUNE! SOMEONE "HEARD" HIS REQUEST AND IS SPONSORING HIM.